In the medieval period new shoes were available only to a tiny elite of aristocrats and wealthy merchants. 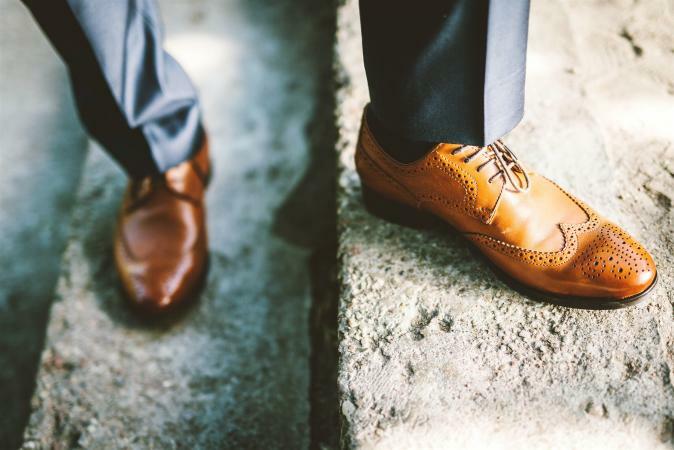 However, it appears that in Britain almost all of the poor wore some kind of footwear, which was made possible through the widespread practice of remaking and repairing old shoes. Medieval shoes were made from leather, silk, and other cloths and up to the end of the sixteenth century, all men's footwear tended to be flat. The most extreme style of the fourteenth and fifteenth centuries was the "poulaine," or "pike," which featured extremely pointed toes, sometimes up to four inches (10 centimeters) in length. Shoes with an arched sole and heel emerged at the end of the sixteenth century, a novelty that was to become a predominant feature of men's shoes in the seventeenth and eighteenth centuries. During the reign of James I (1603-1625), masculine court fashions became particularly flamboyant and stockings and shoes became a key focus of attention. The shoes of the wealthy began to be decorated with large bows, rosettes, or "roses." These styles were superseded in the reign of Charles I (1625-1649), when political instability and war in Britain and Europe encouraged the popularity of military-inspired, knee-high, leather boots. These were fashionable from the 1620s to the 1690s and despite their practical origins as riding wear, they were often elegant and decorative. The rise of France as an international fashion center under Louis XIV (1643-1715) promoted the popularity of French court styles. Shoes were adorned with decorative buckles, a style that remained highly fashionable until the 1780s. Buckles were bought as separate items and by the late eighteenth century they were available for all tastes and pockets, from sparkling precious stones for the wealthy, to plain steel, brass, and pinchbeck for the lower orders. The Enlightenment and the French Revolution (1789- 1799) stimulated tastes for the plain, English, country mode of dress, which dominated international fashion from the 1780s. 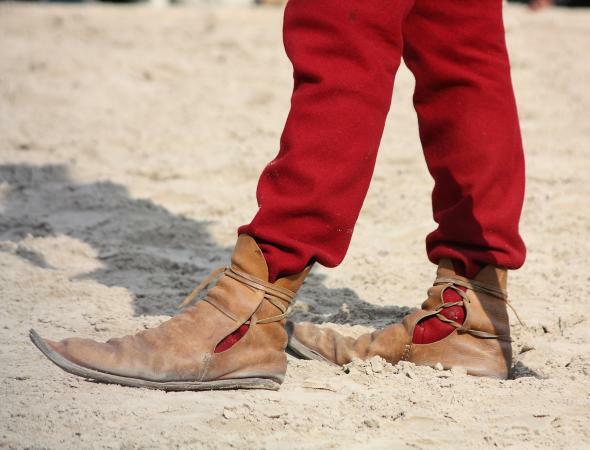 An important element of this style was the jockey or top boot, which featured a top of lighter colored leather. Popular men's wear styles of the early nineteenth century included laced-up walking shoes, flat leather evening pumps, and boots of various styles including top boots, Wellington, Hessian, and Blucher boots. The latter three illustrate the tendency for boot styles of the era to be named after significant military figures or developments. See also Boots; Inuit and Arctic Footwear; Sandals; Shoemaking; Shoes; Women's Shoes; Sneakers; Sport Shoes. de la Haye, Amy. The Cutting Edge: 50 Years of British Fashion 1947-1997. London: V & A Publications, 1996.